The Japan Electric Vehicle Club has succeeded in getting an electric car to run 1,003.184 kilometers without a recharge, far surpassing the world record they achieved last year. The group said it will ask Guinness World Records to officially recognize the journey, completed at an auto racing driving course in Shimotsuma, Ibaraki Prefecture, as the world’s longest. It said the vehicle, which was equipped with Sanyo Electric Co’s lithium-ion battery system, ran for about 27 and a half hours until around 2:30 p.m. Sunday, at a speed of about 40 km per hour. A total of 17 people took turns at the wheel. 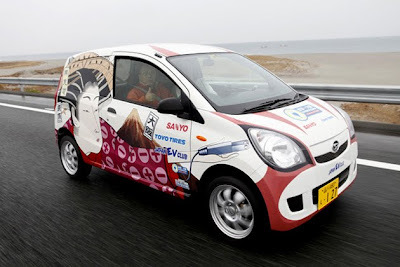 Driving the same brushless DC powered Daihatsu Mira Van as used to set the World Record at 555.6 km (345 miles) in November 2009, the team were able to reduce energy consumption to as little as 60.5 Wh/km. The car carried the same 74 kWh battery pack as used for the previous record with most of the improvement credited to the use of an oval track instead of public roads, weight reduction (including an ultra light weight carbon fiber Recaro seat) and reduced rolling resistance tires provided by Toyo. car can run over 1,000 km without any charging. This is a good solution to decrease global warming and as alternative energy today.